Desiccating side arms make interesting habitats for amphibian. Its a bit a race against time for the tadpoles, as with the falling water level their habitat gets smaller and predators can easier catch them. A pool on the left side, separated from the Mekong river by a sand bank. 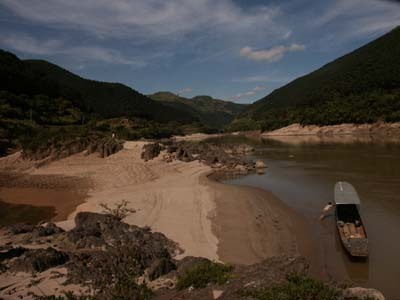 The sands are shifted during every rainy season's high water level. On the sand and stones a characteristic xerophytic vegetation has established. 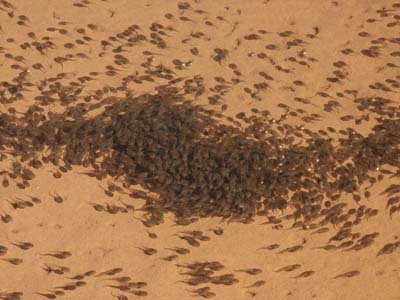 Tadpoles in a shallow pool next to the Mekong (Lancang) river. Also the local pigs like mud pools. 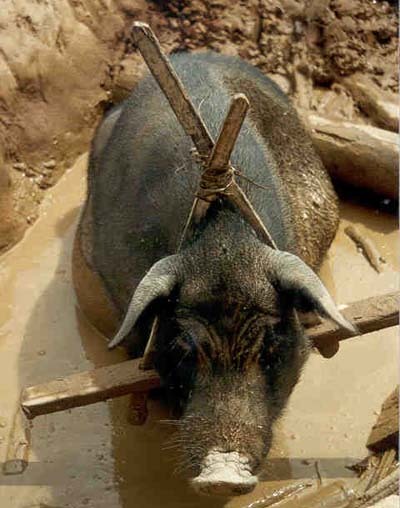 This one has found its way to the pool in spite of the wooden triangle around its neck, which is supposed to prevent the pig from breaking through fences and escaping through thickets. Dai culture without water is unthinkable. Every village and most households do not only have rice fields but also ponds. 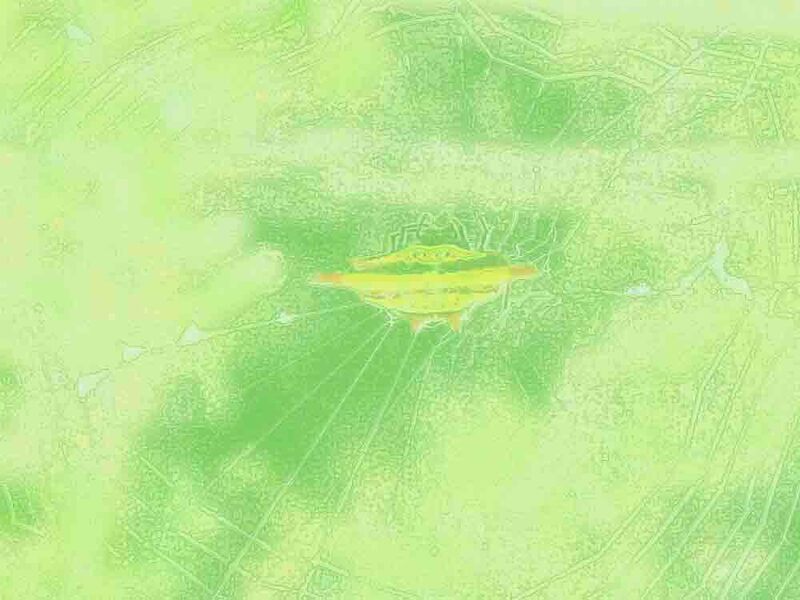 In previous times a multitude of fish species has been cultivated in ponds. Nowadays the fish are mainly introduced species as the Tilapia from Africa and the Tambaqi from the Amazon river. 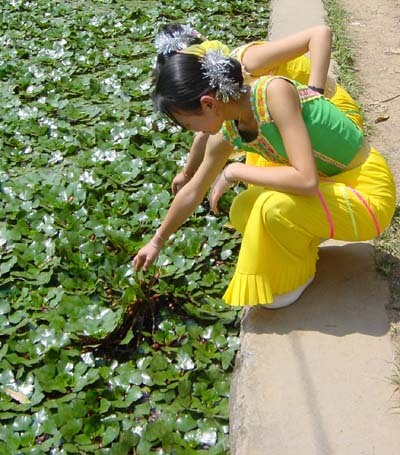 Here two Dai girls checking the fruits of the water chestnut (Trapa natans). 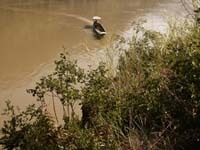 The banks of the upper Mekong river are a peculiar habitat of extreme environmental conditions. During rainy season the water level can be more than 20 meters higher at some places. Some plant species have adapted to this special environment and can even take inundation by the torrential waters. 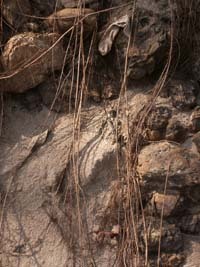 Roots of shrubs at the Mekong banks reaching the dry season water level of the river. 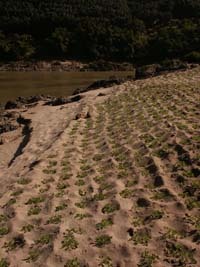 Farming systems in the drift sands of the Mekong river. The farmers use corn, peanuts, and sweet potatoes.